Animals: Horses, Frogs, Dogs and Puppies, Songbirds, Dragons, Badgers, Hummingbirds. Plants: All White Flowers, Rosemary,Sage, Narcissus, Pansies, Daffodils, Cedar, Pine. Incenses/Oils: Lavender, Geranium, Narcissus, Sandalwood, Bergamot, and Neroli. 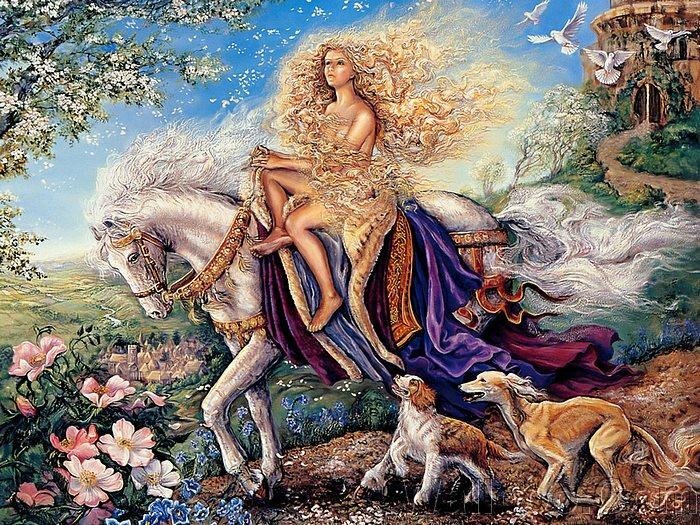 The Celtic Moon Goddess Rhiannon was born at the first Moon Rise and is known as the Divine Queen of Faeries. She is the Goddess of fertility, rebirth, wisdom, magick, transformation, beauty, artistic inspiration and poetry. Rhiannon manifests as a beautiful young woman dressed in gold, riding a pale horse, with singing birds flying around her head. The singing birds can wake spirits or grant sleep to mortals. Much of what we know of Her comes from the ancient Welsh folklore book The Mabinogion by Lady Charlotte Guest. While our riding one day, Pwell Lord of the Kingdom of Dyfed, saw a gorgeous woman dressed in gold and riding a white mare. Pwell chased after Rhiannon, but could not catch Her, no matter how fast he rode. Finally Pwell called to Her and She stopped. When he asked Her why She had eluded him, Rhiannon replied that he had only to ask Her to stop. Rhiannon and Pwell were married and Rhiannon gave birth to a son called Pryderi. When the infant was three days old, on the night of May Eve, the nurse-maids charged with watching over Pryderi fell asleep. When they awoke they found the baby missing and in a panic smeared puppy blood on the lips of the sleeping Rhiannon and accused Her of killing and eating Pryderi. Rhiannon was found guilty of infanticide and was ordered by Pwell to spend seven years seated at the city gates confessing Her crime to all who approached and then carrying them to court upon Her back. Meanwhile a beautiful mare owned by Teyrnon gave birth to a foal every May Eve and every May Eve the foal vanished. He decided to keep watch inside the stable and just as his mare gave birth, a huge clawed hand reached in the window to grab the foal. Teyrnon hacked off the hand with his sword and the foal was saved. Teyrnon ran outside to capture the thief, but found no one .When he returned to the barn he discovered a beautiful baby boy, whom he and his wife adopted. After a time the couple noticed that the child had an affinity for horses, had supernatural powers, and had begun to resemble Pwell. Teyrnon deduced that the child was Pwell and Rhiannon's son and so returned him to his parents. After Teyrnon told the story of how the child was found, Rhiannon was exonerated and again took Her place in the palace as Queen. The story of Rhiannon teaches us that with truth, patience, and love we can create change no matter how bleak life seems at the moment. Ideally Rhiannon would be worshiped at night with Moon high in the sky, within a grove of trees, upon an Altar made from forest materials. In the real world we can create an Altar to Her made of wood or stone, adorned with images of horses, birds, golden or white candles, and a bouquet of daffodils, pansies or pure white flowers. Soft music playing in the background would be a perfect offering to Her. Call on Her to reveal the truth in dreams, and to remove the role of victim from our lives. She teaches us patience, forgiveness and guides us to overcome injustice. She will aid us in magick concerning Moon Rituals, fertility, prosperity, divination and self-confidence. In Britain on September 18 people gather to scour the chalk of the Uffington White Horse. 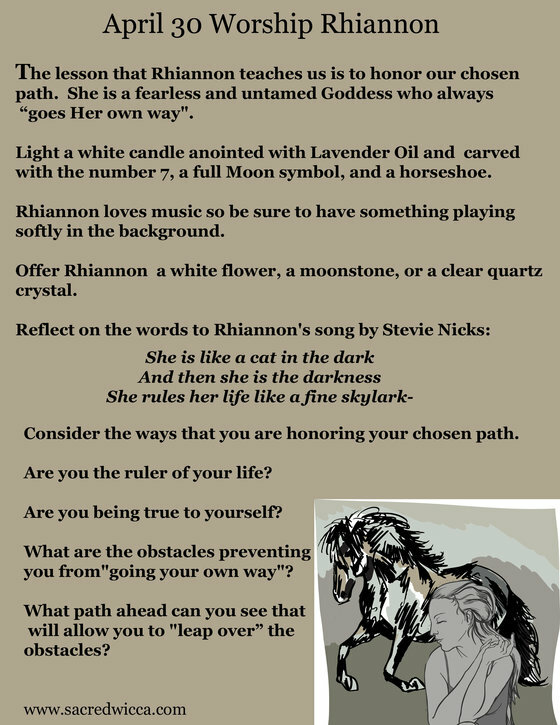 This ancient ritual has kept the image of the horse and the Legend of Rhiannon alive and relevant. Sacred Texts – The Mabinogion by Lady Charlotte Guest.